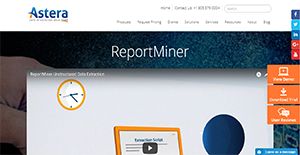 ReportMiner is a high-performance data mining and extraction solution from Astera Software. The application is capable of ingesting data from different file formats and even from unstructured data sources. This allows business users to complete their business data and load them into their preferred business database platforms. ReportMiner is also a user-friendly application. Its interface is arranged in a manner that even those with little to no technical knowledge can effortlessly navigate the solution. The application even comes with a process walkthrough for careful identification and extraction of data. With ReportMiner, businesses get more done in a little time. That is because the software is equipped with an automation feature that allows it to instantly pinpoint names and addresses and parse and extract them. ReportMiner ensures that businesses can extract data from any data source. This means that it can liberate information from PDFs, TXT, word processor documents, Excel files, and more. On top of that, the application is equipped with data transformation and loading features that enable it to handle data from extraction to integration with ease. The enterprise version of ReportMiner comes with a task scheduling and automation feature. This means that the application is capable of automating extraction, transforming, and loading process as scheduled and also deploy other calendarized tasks such as maintenance. This allows businesses to focus more of their energies on other responsibilities and let the software help them increase their productivity. ReportMiner requires no technical knowledge for deep understanding and use. This allows the less tech-savvy people to perform the necessary tasks without utilizing costly IT services. The interface even comes with a process walkthrough that guides users from data identification, extraction logic building, and choosing a destination point for the data. ReportMiner is also capable of automatically parsing names and addresses from any data source. This streamlines the workflow further since the application is able to conduct this necessary task without further intervention from the user. This saves time and also ensures that data quality remains high. ReportMiner runs on a supercharged parallel processing engine. This enables the application to distribute workflow components across several servers as needed to ensure smooth operations. The software also scales automatically depending on the processing power it can tap on. This way, business processes can continue to run even in cases of server and network downtimes. If you are considering ReportMiner it could also be a good idea to investigate other subcategories of Best Business Intelligence Software gathered in our database of B2B software reviews. Every enterprise has its own characteristics, and may need a specific Business Intelligence Software solution that will be adjusted to their business size, type of customers and staff and even individual industry they deal with. You should not count on finding an ideal app that is going to be suitable for each company regardless of their background is. It may be a good idea to read a few ReportMiner reviews first and even then you should remember what the software is intended to do for your business and your staff. Do you require an easy and intuitive solution with just basic functions? Will you really use the advanced functionalities needed by pros and big enterprises? Are there any particular tools that are especially practical for the industry you work in? If you ask yourself these questions it is going to be much easier to locate a reliable solution that will fit your budget. How Much Does ReportMiner Cost? We realize that when you make a decision to buy Business Intelligence Software it’s important not only to see how experts evaluate it in their reviews, but also to find out if the real people and companies that buy it are actually satisfied with the product. That’s why we’ve created our behavior-based Customer Satisfaction Algorithm™ that gathers customer reviews, comments and ReportMiner reviews across a wide range of social media sites. The data is then presented in an easy to digest form showing how many people had positive and negative experience with ReportMiner. With that information at hand you should be equipped to make an informed buying decision that you won’t regret. What are ReportMiner pricing details? What integrations are available for ReportMiner? If you need more information about ReportMiner or you simply have a question let us know what you need and we’ll forward your request directly to the vendor.